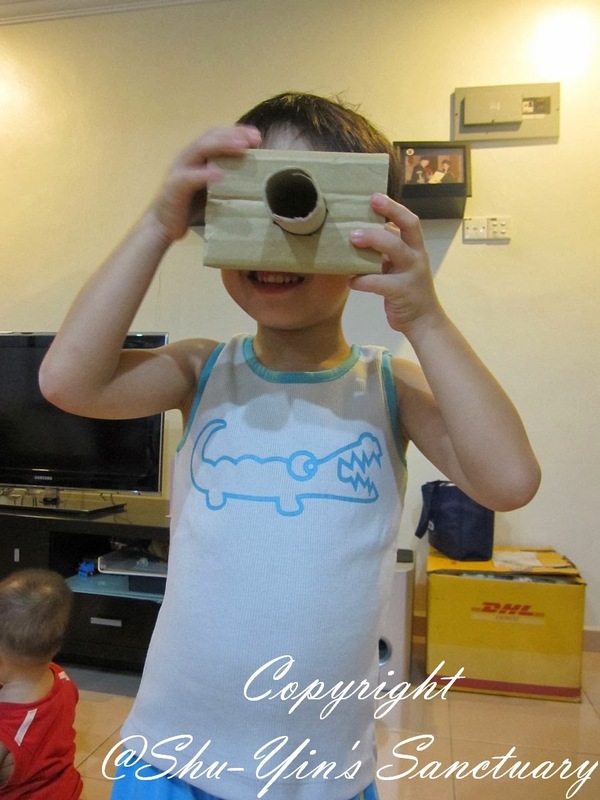 I know there are many online stores overseas selling organic and eco-friendly clothing and stuff for kids, but Be Green Bebe is the first Malaysian online store I know that is selling that. So I was really glad when Khye had the opportunity to try on their clothing. WHAT AND WHO IS BE GREEN BEBE? 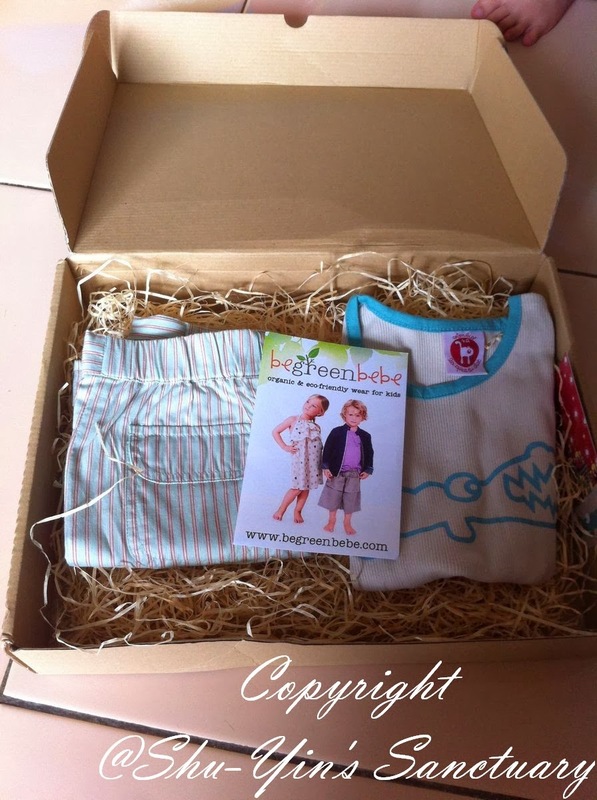 Be Green Bebe is an online boutique based in Malaysia, featuring quality handpicked organic and eco-friendly clothing and accessories for babies and children. 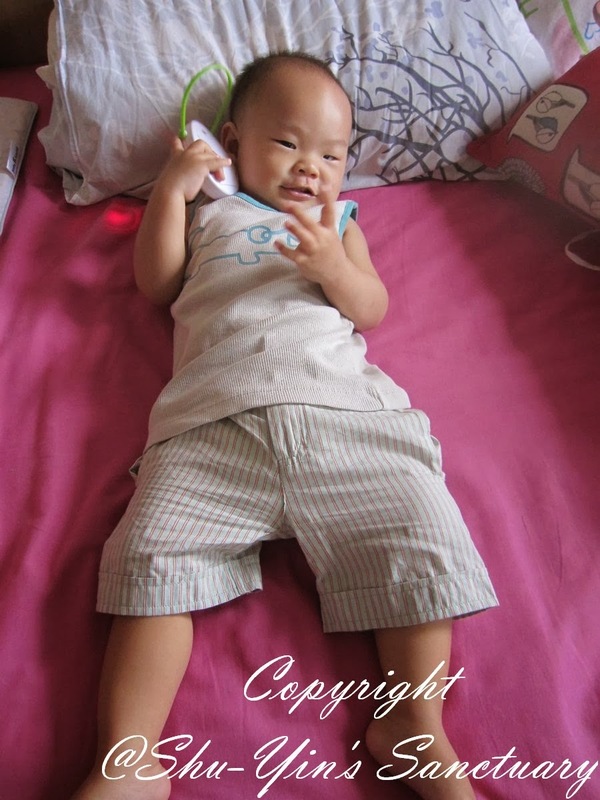 The products are high-quality which are not only great for baby's skin and developing immune system, but are also stylish , practical and comfortable. They are handpicked and imported from US, Europe and Australia. 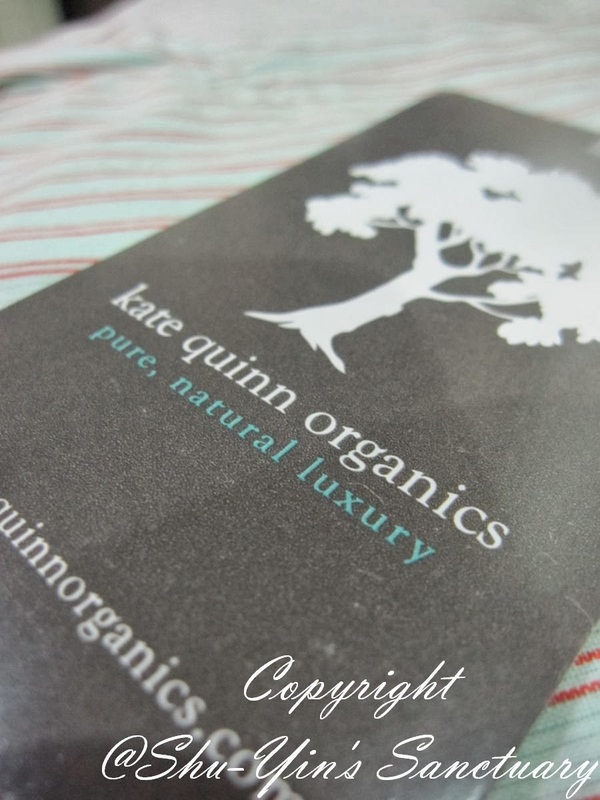 According to the Organic Trade Association, organic refers to the way agricultural products are grown and processed. Organic production is based on a system of farming that maintains and replenishes soil fertility without the use of toxic and harmful pesticides and fertilisers. 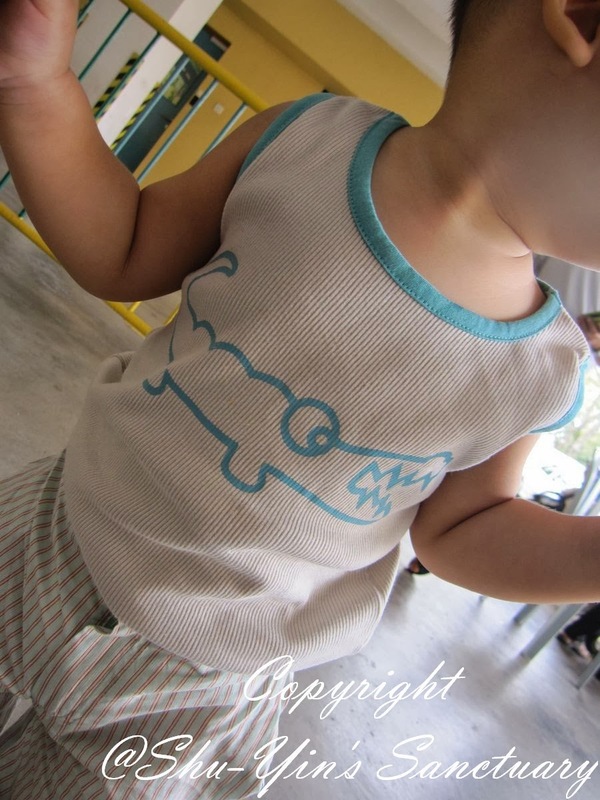 WHY SHOULD I BUY ORGANIC CLOTHING FOR MY CHILD? 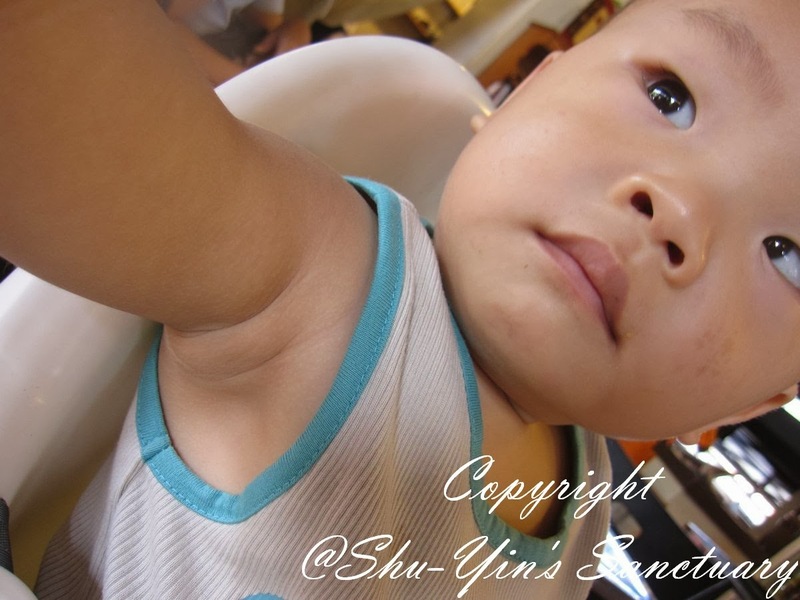 Our babies' immune systems are extremely delicate and sensitive. 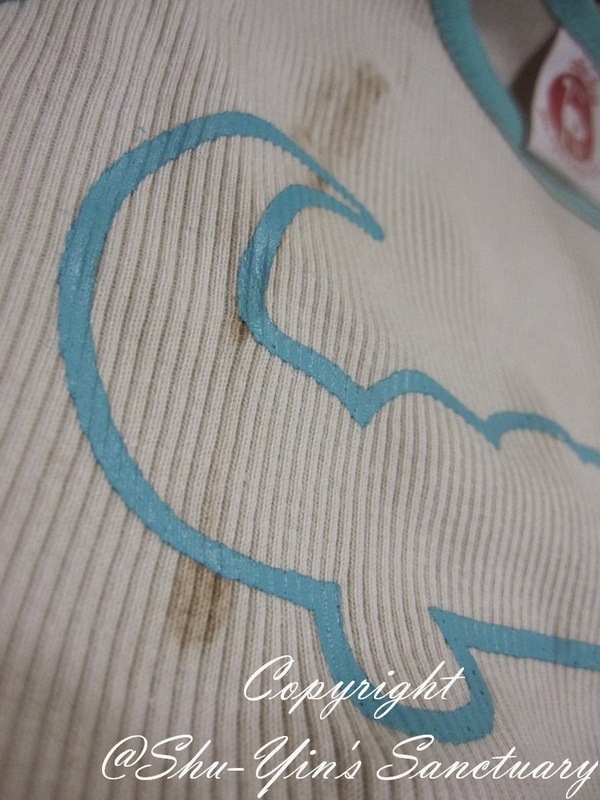 As conventional cotton clothing retains harmful toxic residues this can cause allergic reactions and eczema on sensitive skin. 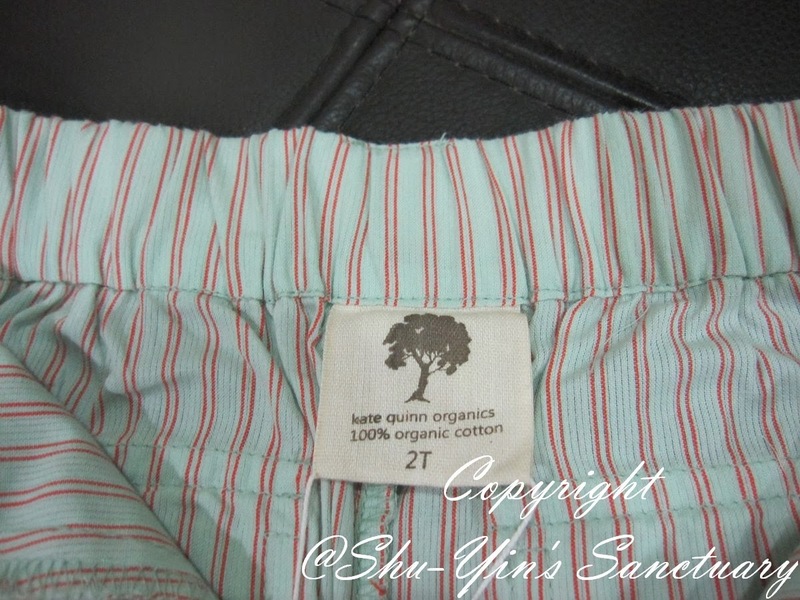 Organic clothing is extremely soft and breathable and offer excellent absorbency. 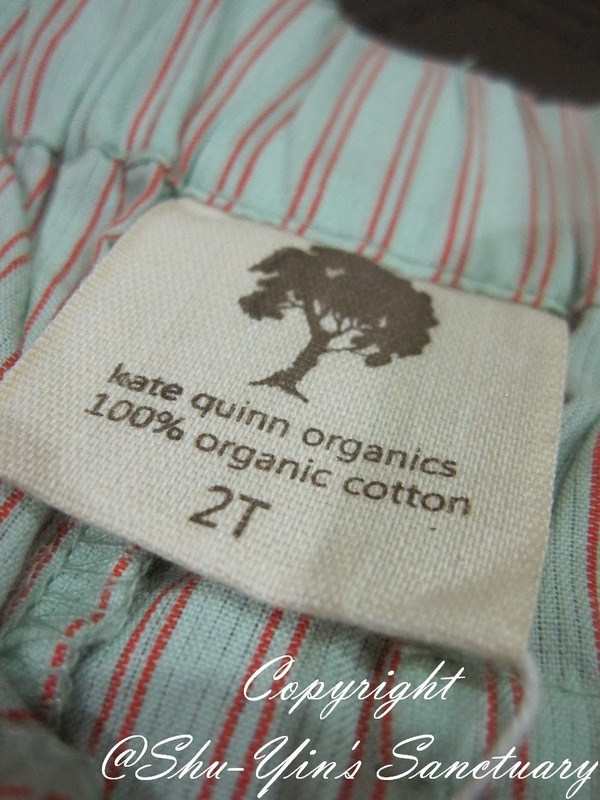 It is often thought that organic clothing is expensive and is a luxury. 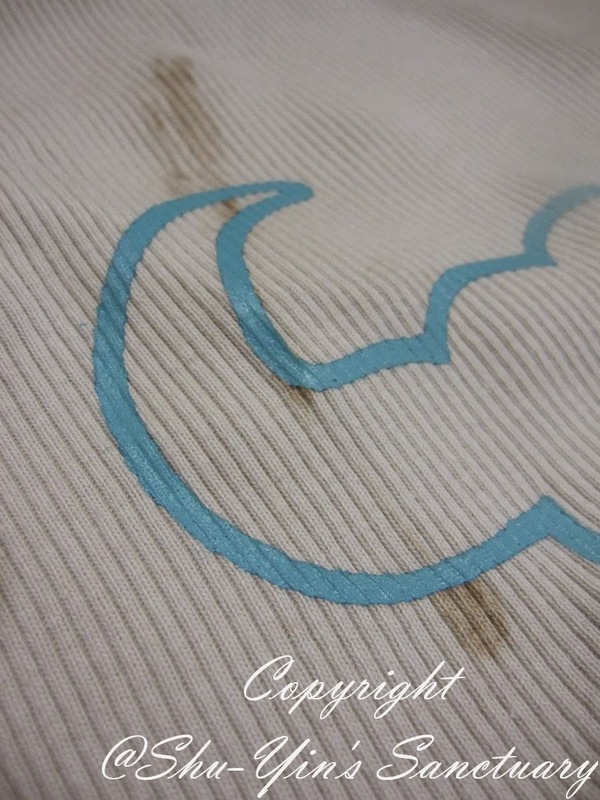 However, organic clothing offers great value given that it is more durable and washes extremely well (and is softer to the touch!). The parcel came in a kraft sturdy box, almost similar to a pizza boy. 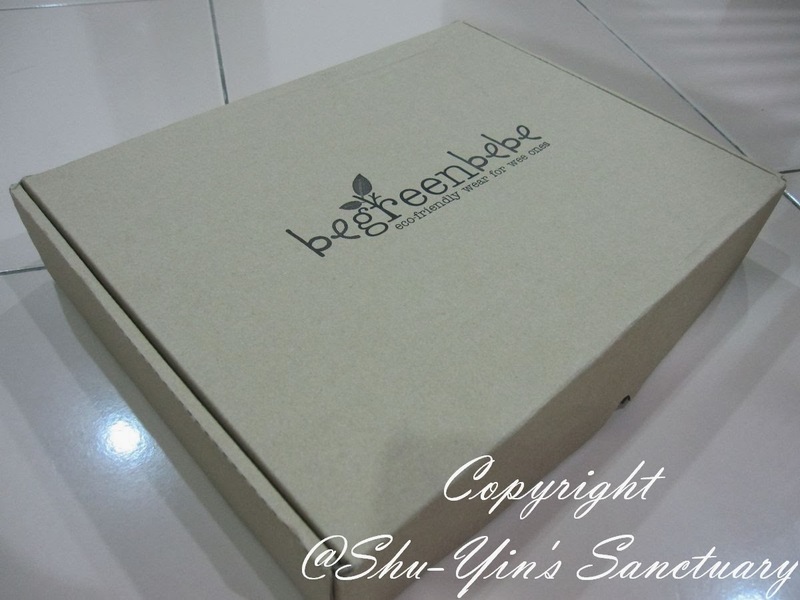 On the center of the box is the Be Green Bebe logo. I like the simple design and also the sturdy box. Upon opening, this is what I saw. A top and a pair of shorts, lined with some shredded paper and also a pamphlet. Firstly, let's have a look at the pair of shorts. 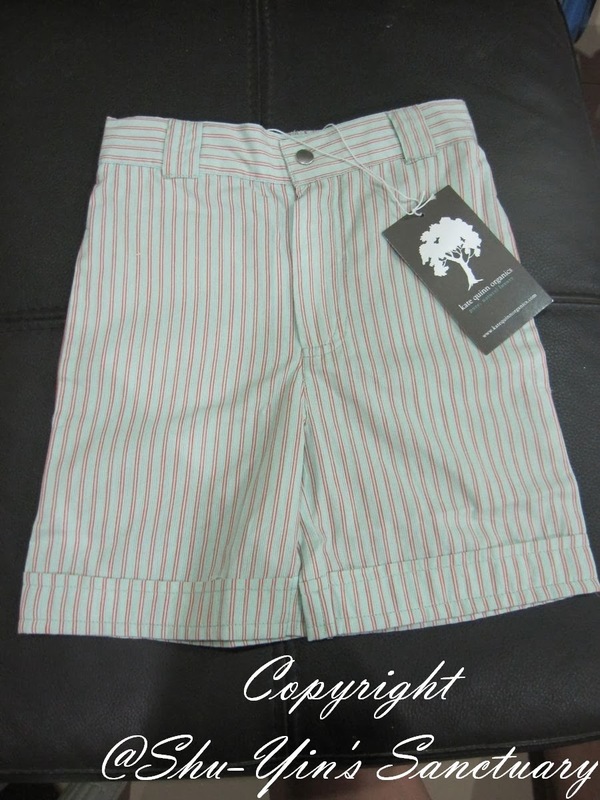 It's a classic boys pocket shorts in lightweight cotton stripes. I super love the pinstriped design. I am into classic stripes and polkas, and the colour is so vintage-y cute. 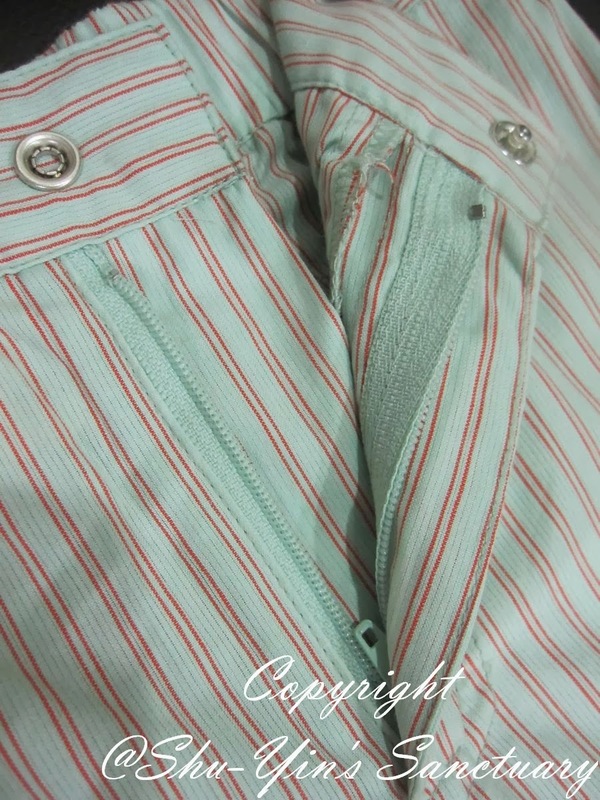 The colour's in mint and with narrow red stripes. And that this is not the usual rubber drawstring pants that I usually buy for Khye. This is like the big boy pants with zip and pockets. Way too cool. Snap button is very secure and tight, which stays on well once snapped. 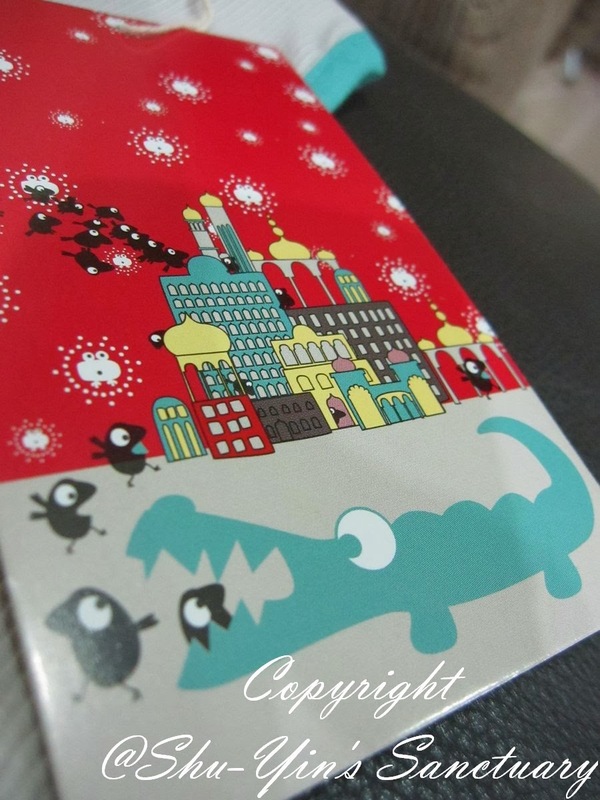 And the zip quality is good. 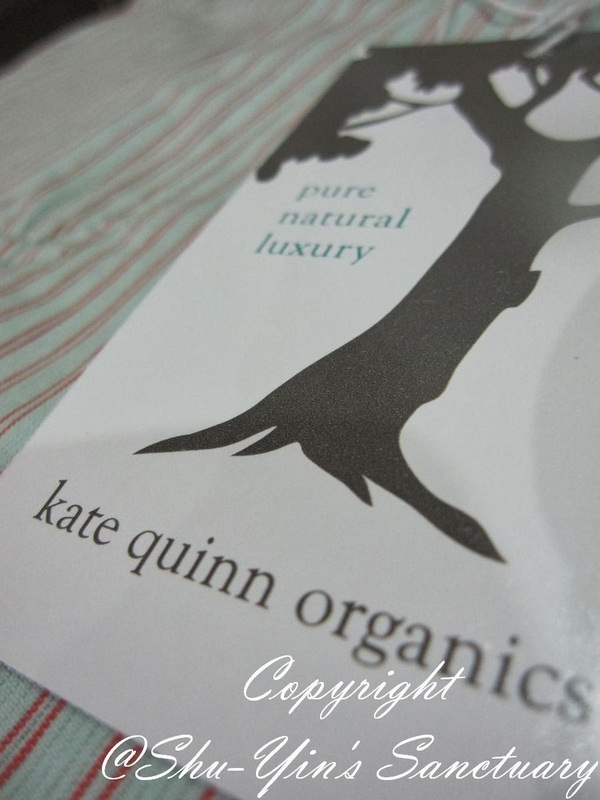 With it is the Kate Quinn Organics brand tag, which reads pure, natural luxury. 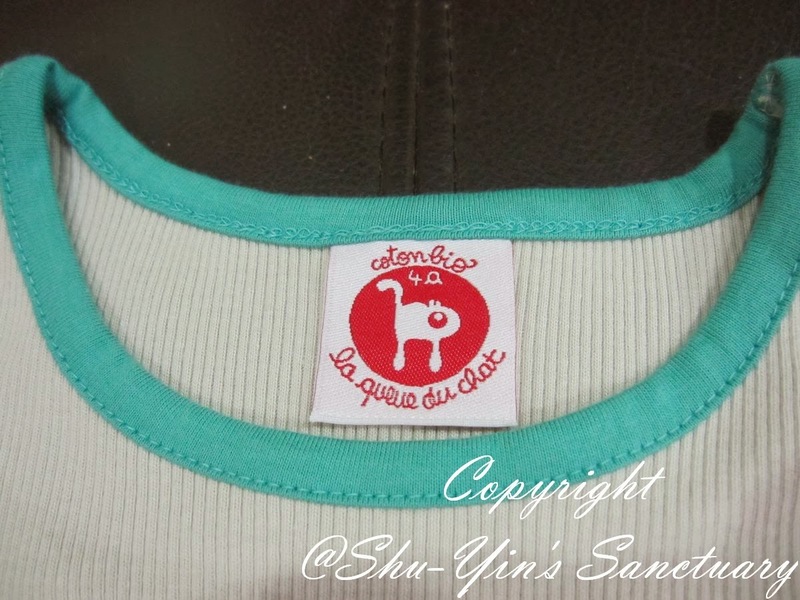 It is really true as the material is made of 100% organic cotton. It is very smooth and soft to the touch. 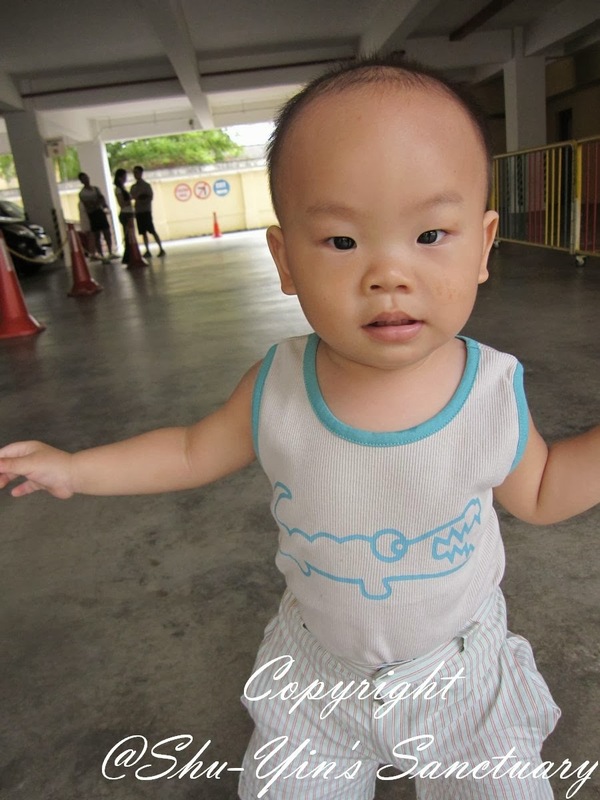 It is also very lightweight, thus perfectly suitable for our hot and humid weather. 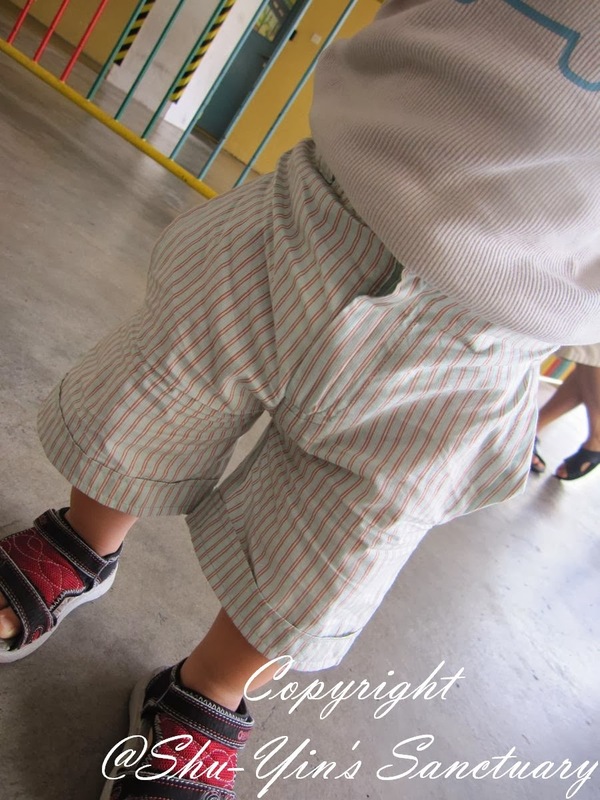 The back of the shorts has a stretchable band, ensuring a good fit. I was sent the 2T size for Khye. Although the size was meant for 2yo and slightly larger for Khye's age, it could still fit Khye pretty well as Khye is rather big sized for his age, and also thanks to the stretchable band behind. And I like that because of that, the shorts falls below his knees. 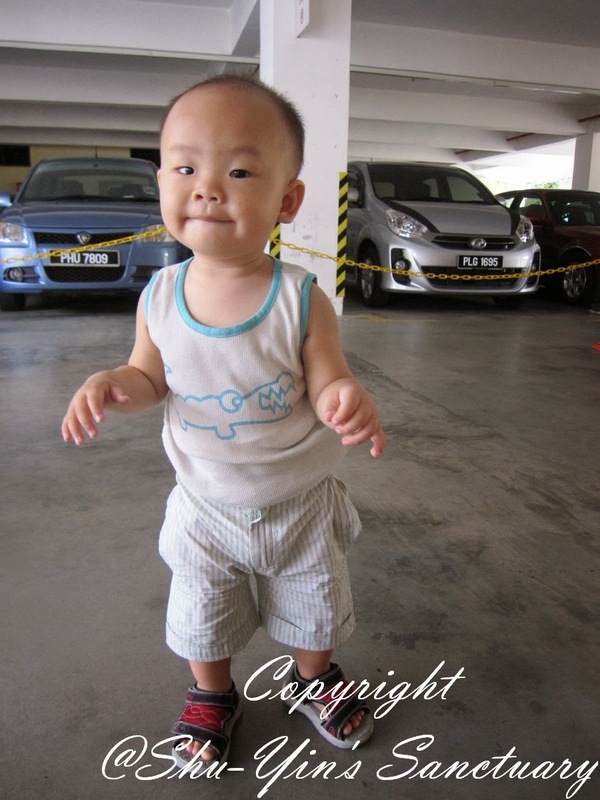 This is good for Khye who just recently learnt how to walk. So just in case he stumbled and fall (quite often actually), it protects his knee from getting scraped. Super thumbs up for this! Now, let's look at the top they sent to me. 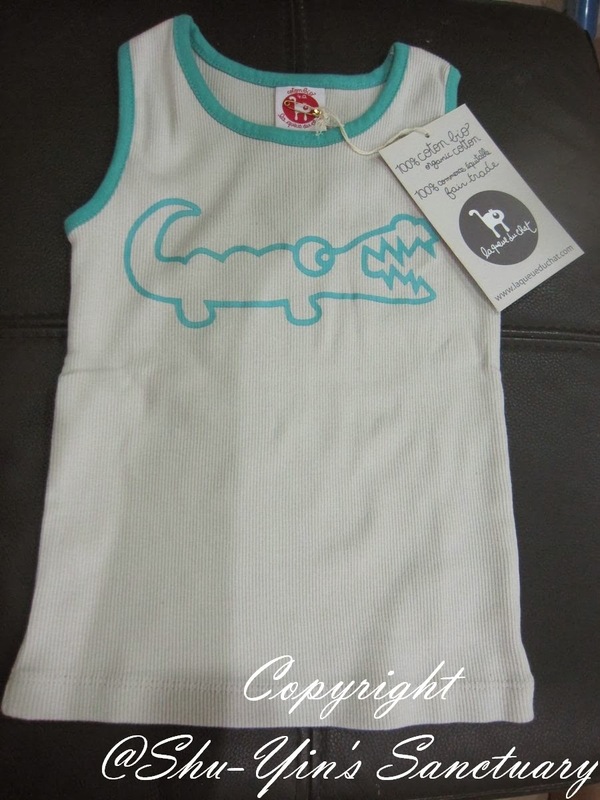 It is a white vest with striking blue trim, printed with one of LQDC's latest illustration, Remy the Croc. 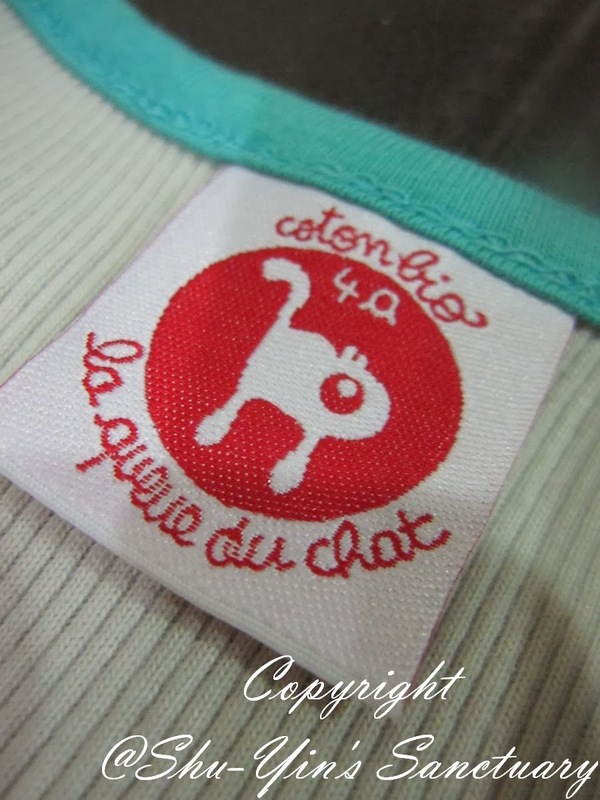 In it came with a tag of the brand La Queue du Chat, which also states that it is made of 100% organic cotton. I like that this is a vest, as it is sleeveless and perfect for our whole-year-long-summer weather. I also like the pastel blue trim colour, making it very pleasant to the eye, and also totally match the shorts they paired it with. 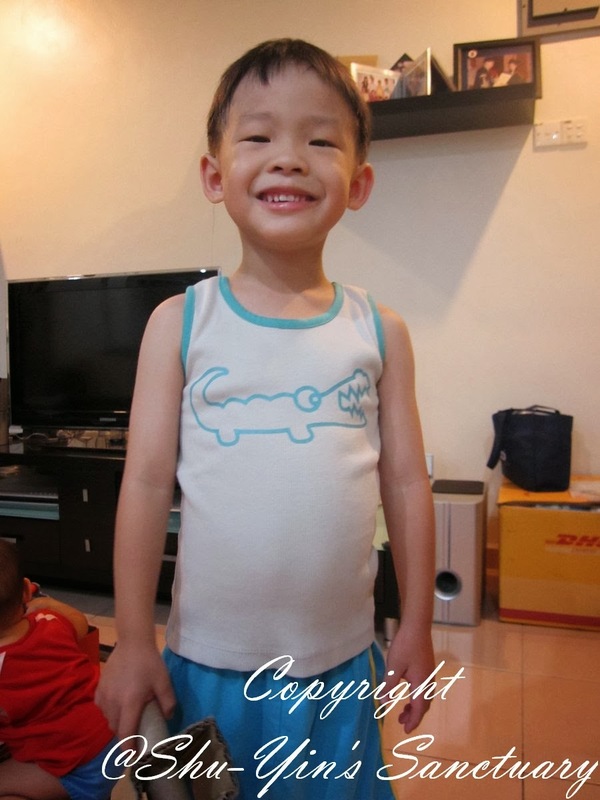 And because the cutting is very small, they sent to me size 4a, which I supposed is meant for 4 yrs old. But the cutting is indeed very small when I saw it, and I doubt that it would fit Shern. Anyway, I had nothing to lose because if it doesn't fit Shern, then it would fit Khye soon. And sure enough, it does fit Khye. It is a little large on him but still alright. And although it is a little bit long, it didn't matter once I tucked the vest into his shorts. This is the length of the vest if I don't tuck it in, a bit too long. But he still looks cute this way though. The armpit area also fits Khye quite well. Ok, let's now see wearing both the vest and the shorts. It fitted him well. Look at him happily wearing them with ease. 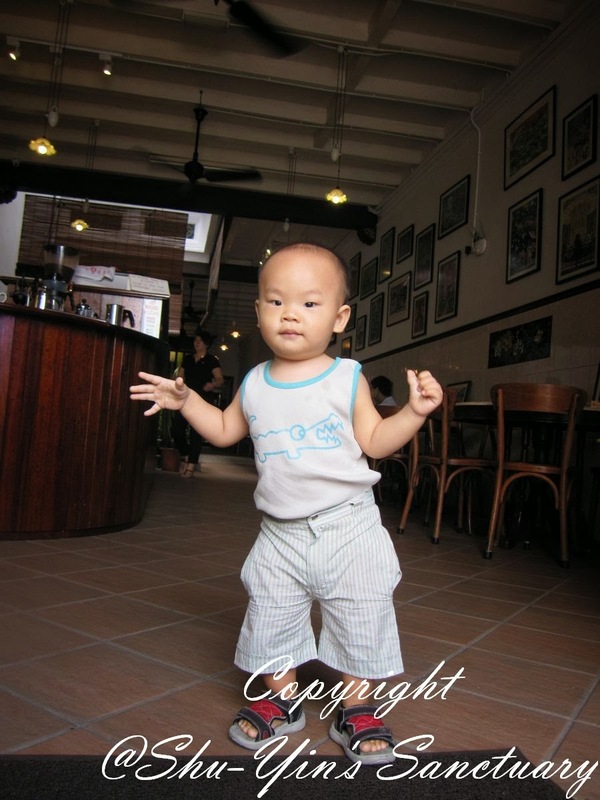 We love the outdoors and had also recently went for cafe hunting around Georgetown heritage area, which some of the cafes could be rather hot. So the sleeveless vest and light shorts are just the perfect outfit for Khye. These shots were taken on the way out of our house. 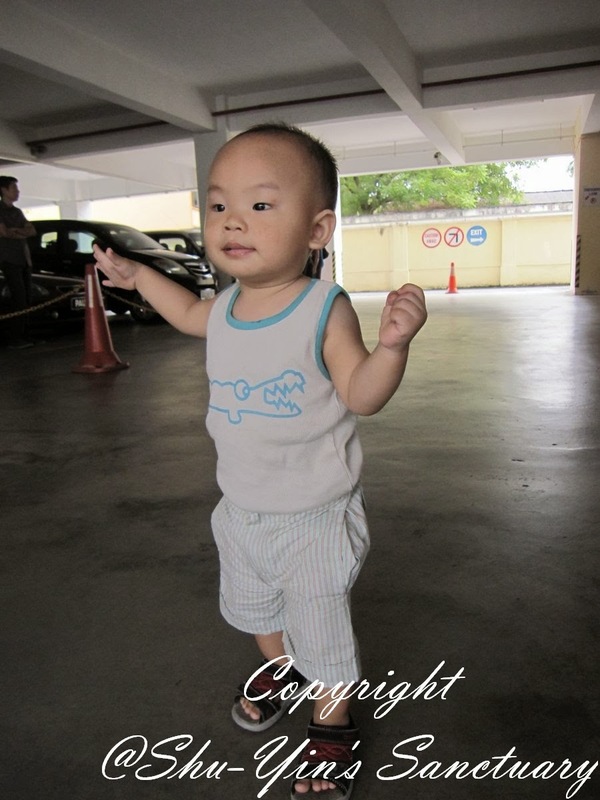 Khye walking all by himself to the lift. At one of the heritage cafes in town. Khye looked really handsome wearing the clothing. And most importantly, he was comfortable wearing them. After wearing them for the whole day, with sweat and all, his armpits and back didn't got all red like some clothes does to him because Khye sweats easily. Maybe because this is sleeveless and thus the sweat doesn't get trapped there, and maybe because of the comfy organic cotton. Khye smeared some food on his clothes when we were dining outside. Once home, i rinsed it off with water and it came off easily! And guess what? I let Shern tried on the vest as well. And I was surprised to see it could fit Shern too, though it was a tight squeeze. It was a little too tight for him especially on his armpit areas, and I could also see his bulging tummy. Haha. So this vest is definitely for Khye! 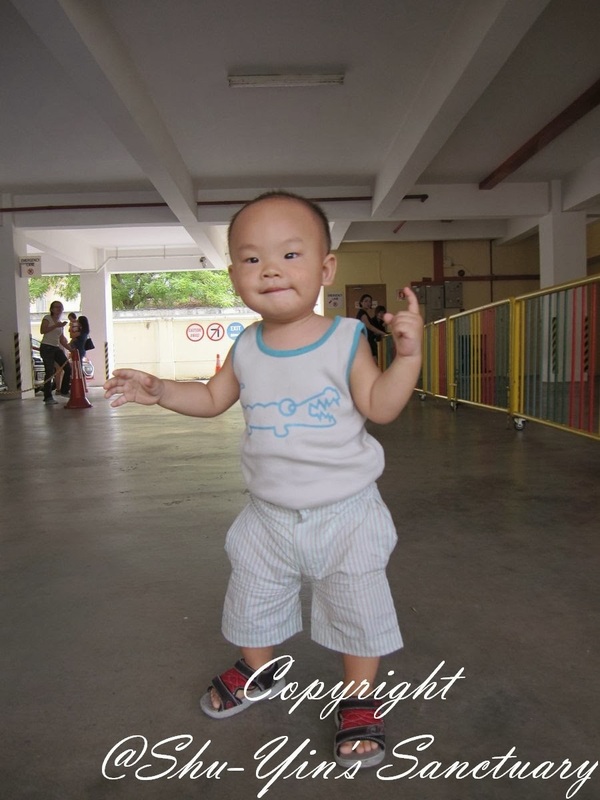 So I must say that 4a size is definitely too small for a 4 1/2 year old, although Shern is considered quite small size. So if you like this vest as much as I do, please purchase one or two sizes up as the size for this vest is small! 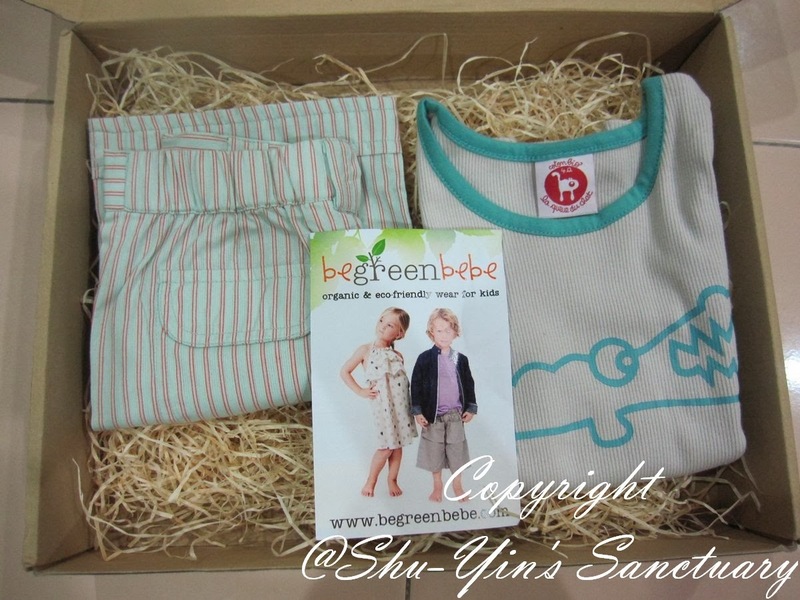 All in all, I love these organic and eco-friendly clothing from Be Green Bebe. They are of high quality, and yet stylish and comfortable! So what are you guys still waiting for? 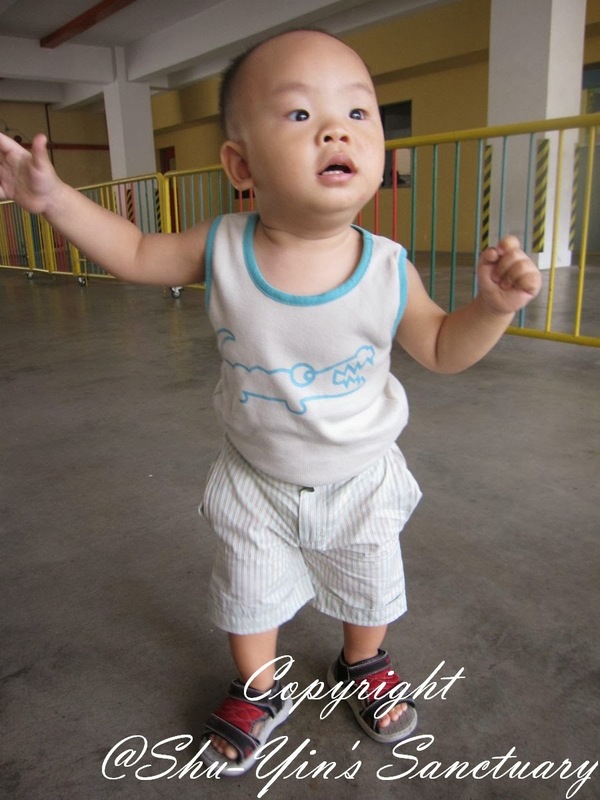 Now's the best time to score some stylish yet comfy CNY clothing for your little ones! 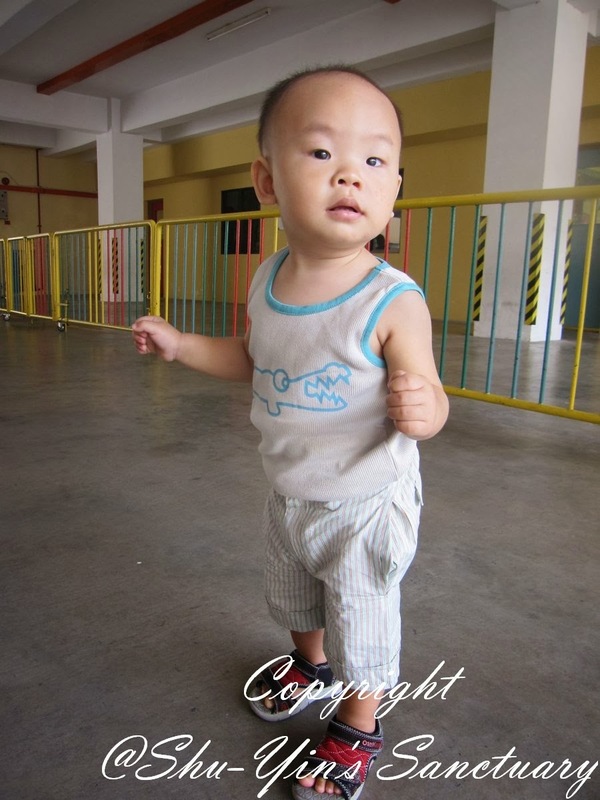 You can purchase the these organic and eco-friendly baby and kids clothing at Be Green Bebe online store. 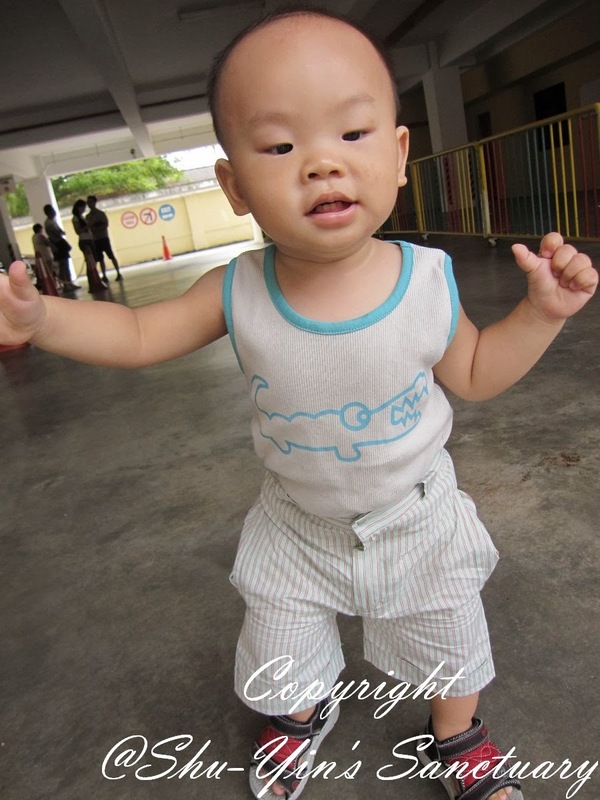 There are many gorgeous clothing choices for both boys and girls, and also a range of accessories avail such as swaddles, blankets, backpacks and even swimsuits. Check them out! Thanks to Be Green Bebe, there is a discount code for my readers. The discount code is 10PERCENTOFF. Terms are 10% off applies to purchases from now till 31 January 2014, with standard postage rates still apply. 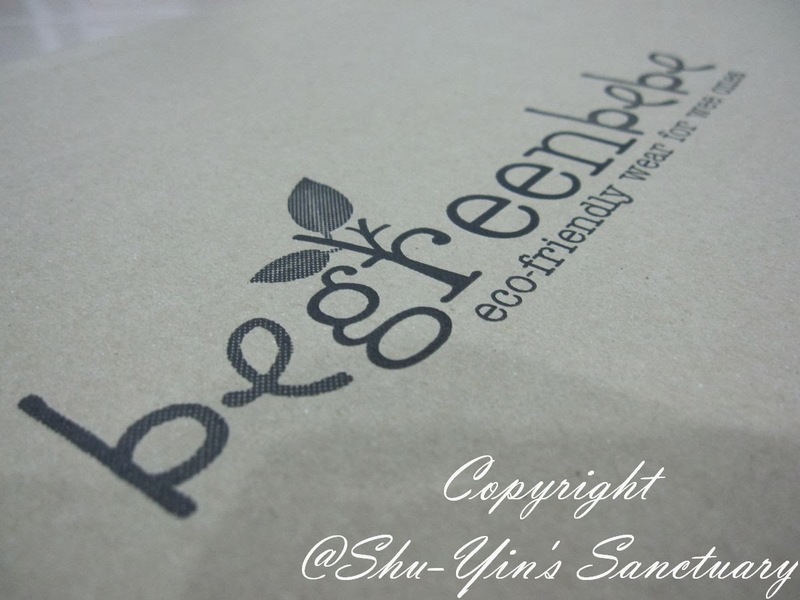 For more info, please visit Be Green Bebe website or their Facebook page. 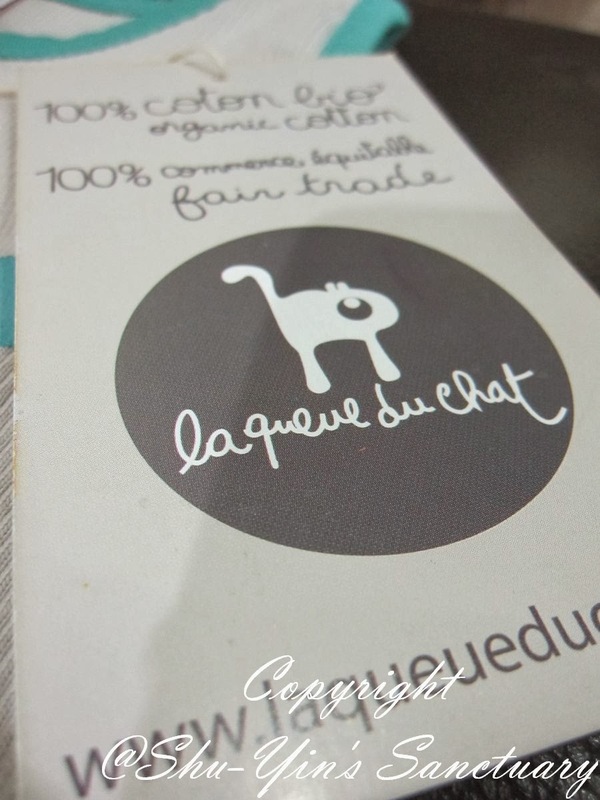 * Disclosure: I received a Kate Quinn Organics's Pinstripe Pocket Shorts and La Queue du Chat's Croc Print Vest - The Marseille' for review purpose, but no monetary incentive was received. All text and opinions are of my own and represents my honest opinion of the product(s).